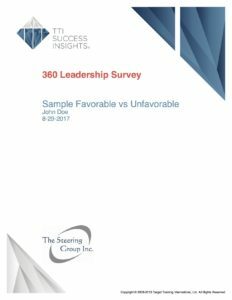 TTI OD/360 Surveys are assessment tools that provide leaders and employees with feedback about their performance. The surveys’ subject is rated in areas such as leadership, communication, productivity, and technical skills. The subject also rates themselves in these areas. Responses are scored numerically. Higher scores represent strengths and lower scores represent weaknesses. All of the information is compiled into a report that assembles the results into graphs summarizing the rater responses. The graphs illustrate the employee’s strengths and weaknesses. Participants use this information to make changes in their behavior and performance. You don’t have to spend hours developing a survey to assess your organization. ODsurveys Plus offers survey question templates to aid in the development of your fully customizable survey. The need for accurate and timely assessment of organizational development priorities has never been more important than in today’s rapidly evolving workplace. Managers must continually be in touch with customer demands, how to adjust services/products to meet customer expectations, how well employees are achieving organizational goals and where the organization needs realignment in order to succeed. However, these areas continually change, presenting management with moving targets. ODsurveys Plus provides an efficient alternative to the labor intensive survey process. Now your organization can quickly identify the types of interventions required to grow. Surveys are completely customizable to measure what you need to know and are easily administered 24/7 through secure online access. Providing the best products or services to your clients is critical to success. A customer feedback survey will give you the valuable feedback you need to ensure your clients will continue to support your organization. The customer feedback survey also tells your clients that you care about your relationship with them. Get the facts related to the success of your new marketing plan, or an evaluation of a new product. Since each survey can be customized to suit your needs, you are in control of the parameters. You choose the survey titles, content, respondent instructions, demographic filters, categories, questions, rating scales and comment areas. Survey results can be viewed in a variety of report options, including mean score, unfavorable/favorable, frequency distribution and written comments report. ODsurveys Plus brings all the value with minimal time investment. With the ability to complete surveys anywhere, anytime, it is fast and easy to obtain crucial decision-making information that will support continued organizational success.